Having taught high school Algebra, I can tell you that one of the most difficult concepts for students to understand is factoring polynomials. And I believe the struggle comes down to a lack of understanding of multiplication and factoring whole numbers. If students don’t have a clear understanding of what the factors are for say, 24, how in the world can they find and understand the factors of 3x + 3? 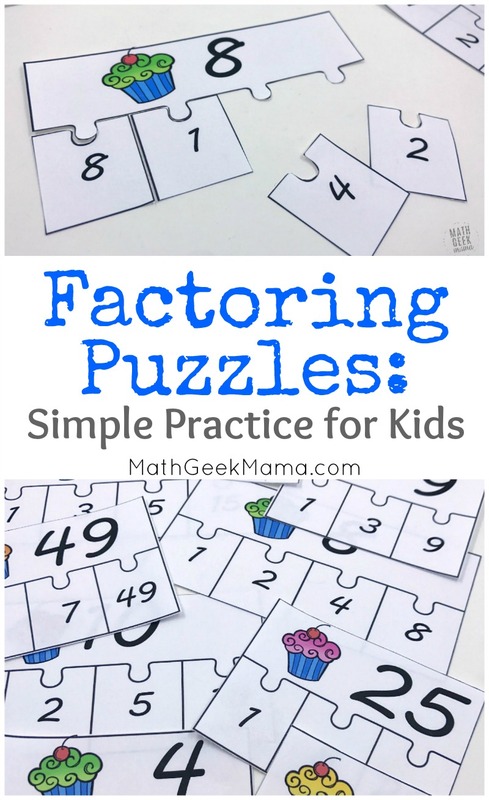 So today, I’m sharing a new free resource to help kids with factoring whole numbers, so you can help them to really understand and be familiar with factors. Then hopefully the more advanced problems in Algebra won’t seem so hard. First, you’ll want to be sure kids actually know what a factor is. Math vocabulary is very important, so you’ll want to tie this new word to things they already know, like multiplication and equal groups. So what is a factor? A factor is a number that is multiplied. When you multiply two factors, they equal the product, which is the answer to a multiplication problem. For example, in the problem 6 x 3 = 18, 6 is a factor, 3 is a factor and 18 is the product. This is fairly straightforward for most students. The trouble then, comes when we start working backwards and want to find ALL the factors of 18. This means finding all the numbers that can be multiplied to another number to equal 18. Or another way to think of it is all the numbers that can be divided equally into 18. First of all, we have 1 and 18. This is the case for every whole number (meaning, 1 and the number are factors). Then we have 2 x 9, so 2 and 9 are factors. Then we have 3 x 6, so 3 and 6 are factors. 18 is not divisible by 4 or 5, so we now see that we have all the factors of 18: 1, 2, 3, 6, 9, 18. 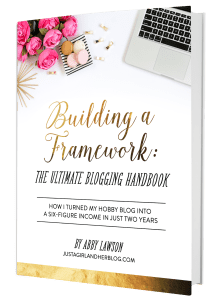 When you’re first introducing this, you’ll want to be sure to use hands on tools and/or visual models. Personally, I like to create factor rainbows, which connect pairs of factors that are equal to the product. This helps to show the factor pairs, and provides a systematic approach, so you can easily see that when you get to a factor you’ve already found, you know you’re finished. If you just randomly start listing factors or pairs that you know, without any order or system you could easily forget or miss something. See a picture of what I mean in this post. Once students understand the vocabulary and know how to draw a visual to solve, they need to practice, practice practice. 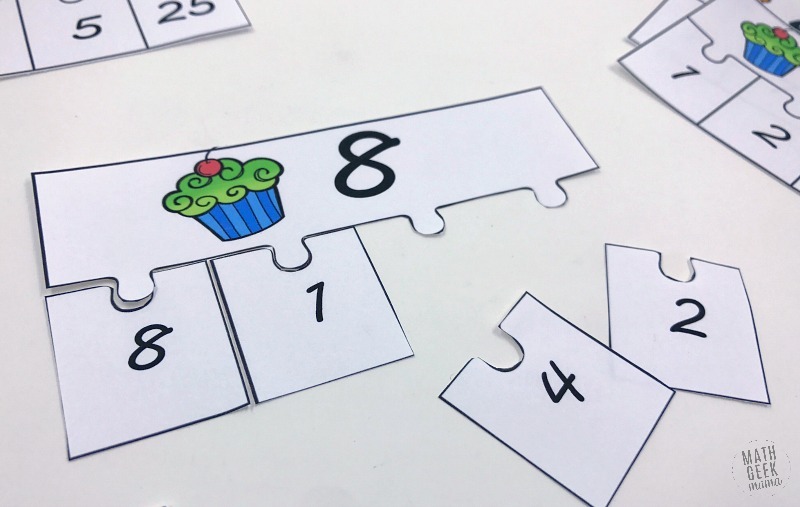 Now is the time you can pull out these simple and fun factoring puzzles! These take a little bit of prep work, but once they’re ready you can use them again and again. First, print all the puzzles on card stock paper. Then I suggest laminating them if you want to use them in your classroom year after year. Once they’re ready, cut out each puzzle, as well as the individual puzzle pieces. Once all the pieces are cut out, you’re all set! Obviously, you can use these puzzles however you’d like, but here are a few ideas of how you can incorporate them into your classroom. One idea is to include them in one of your math centers. 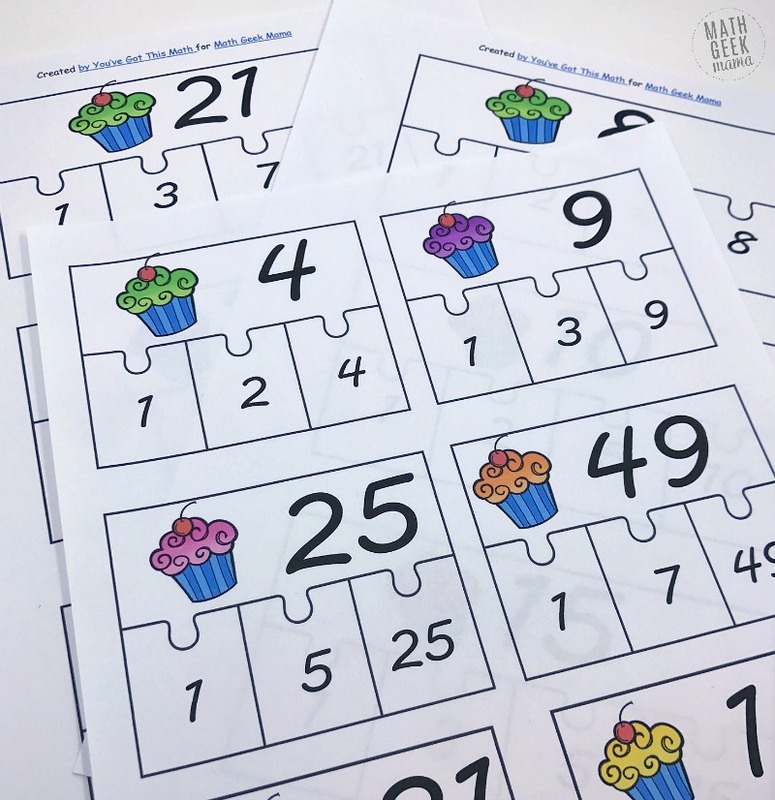 Keep all the puzzle pieces in a big ziplock bag, and then kids can pull them out and work through them in small groups or individually. I would also suggest keeping a small whiteboard and dry erase marker with it so kids can draw a picture or work out the solutions on the whiteboard before they start looking for the correct pieces. 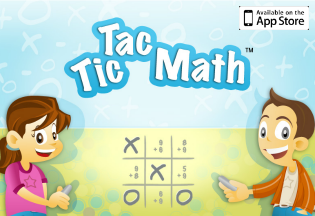 Some of the puzzles are different sizes, which will help with self-checking, but you may also want kids to pair up, so one partner can be the “checker.” Just equip them with a calculator, then they can check each other’s completed puzzles. Another idea is to have this as an option for kids who finish early, or as an activity for kids to review when you have a sub. 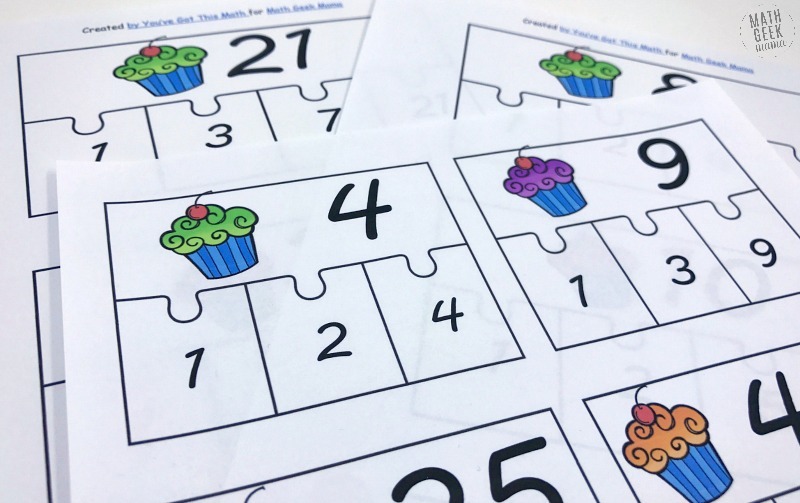 Finally, if you have students who really need to work on this but you don’t have time in class, you can print the puzzles on regular paper and cut them out. Then send them home in a ziplock bag and have kids glue the puzzles down on construction paper as a homework assignment. 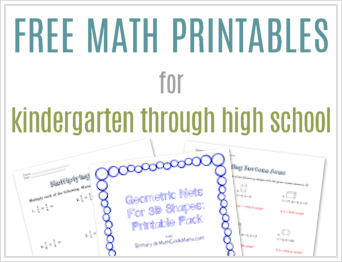 However you use these, I hope it provides a fun way for kids to practice factoring whole numbers! 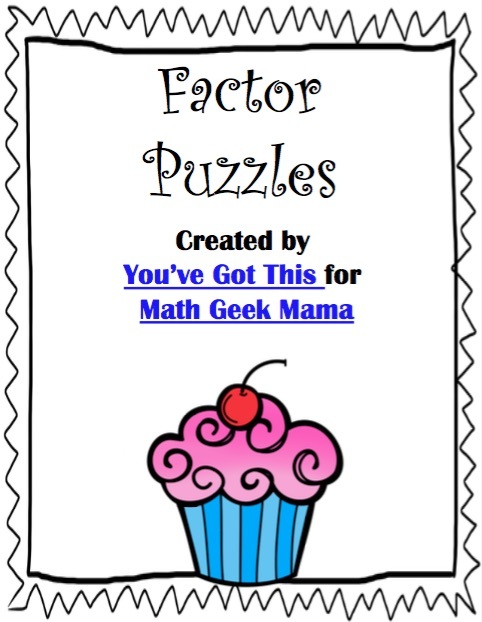 And if you’re looking for more ways to review, try this set of popcorn factoring cards. Or you might like this set of Missing Factor BINGO Games.